DSSA 101 Alco - 1945 RS1 Ex-CGRW #3, exx DSSA #101. Owned by the SLHTS, stored at LSRM. Temporarily repaited in 2009. DM&IR 193 EMD - 1960 SD18 Last SD18 purchased by DM&IR, Chopped nose. Repainted in the 2000's, last paint ever applied by the DM&IR Shops. DM&IR 316 DM&IR - 1990 SD-M Originally built by EMD in 1960. Chop nosed in 1971. Donated to the MRHS in 2008. Stored at LSRM. SOO 700 EMD - 1963 GP30 Ex WC #700, nee SOO #700; unit rides on ALCo trucks, and was repainted into SOO livery in May 2005. SOO 2719 Alco - 1929 4-6-2 Restored to operation, used on the NSSR every fall. LTV 4211 EMD - 1956 F9A Originally nunbered 101. Donated in 2002, leased back to LTV in 2008, back to LSRM in 2009. LTV 4222 EMD - 1956 F9B In service on the Erie Mining since 1956. Donated to the SRM in 2009. WC 7495 >EMD - 1967 SD45 Ex-BN 6417 nee NP 3617; unit will be repainted back into Northern Pacific colors. 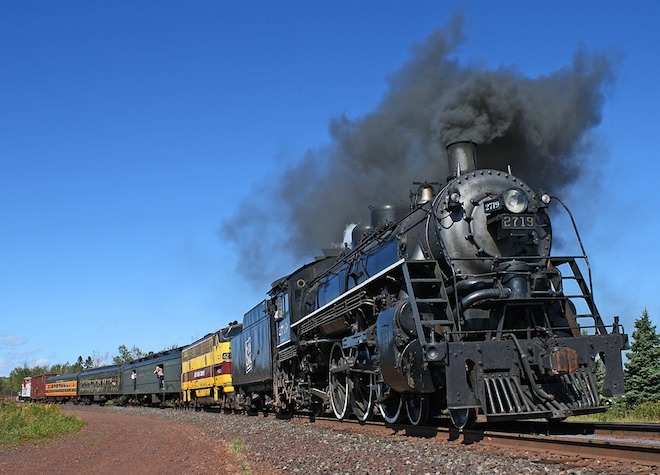 The North Shore Scenic Railroad operates on 26 miles of former Duluth, Missabe and Iron Range Ry. tracks (Lakefront Line) from Duluth,MN to Two Harbors,MN. All locomotives listed are in operating condition and run on the NSSR. The NSSR is operated by the Lake Superior Railroad Museum. Thanks to the following contributors / sources for updates and corrections: Max Medlin.